The Grand Valley in Western Colorado, is just that….GRAND. With the mighty Colorado River running right through it, beautiful vineyards, vibrant agriculture and an attitude for adventure from its communities it’s a wonderful place to live. Surrounded on all sides by beautiful landscape and national parks, the Grand Valley is truly a diamond in the rough. The Happy Valley (as some locals call it) is an epicenter for some of the best recreation and beauty in Colorado. Look east to the Grand Mesa and see opportunities to fish, hike, camp, ski, snowshoe and more. South lies the Colorado National Monument offering its breathtaking red rock canyons winding as far as the eye can see. To the North, we are bordered by the unique Bookcliffs, stunningly beautiful at sunset, home to wild horses, hiking and a dirt bikers paradise. Head west into the sunset and you will end up in Utah where the adventure just continues! The Grand Valley is home to several unique communities offering a little bit of everything. 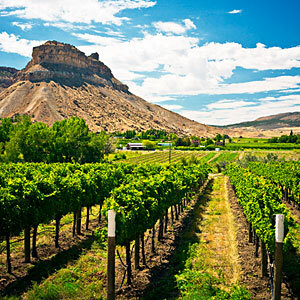 Palisade is Colorado’s wine country and produces the worlds best peaches (look out Georgia peach!) amongst other delicious farm to table food. Grand Junction is a city vibrant with culture and events. Fruita is a wonderful community that hosts the best mountain biking Colorado has to offer. This is why my family loves Western Colorado. We can live and breathe the outdoors. We have a little bit of everything, most of it just minutes away. The Mothers here are family oriented, creative, love to stay active, and don’t mind getting dirty with their kiddos! This is our place for adventure!